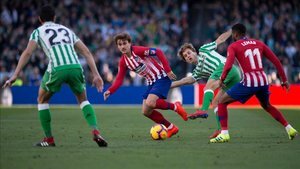 Atletico Madrid failed to cut the gap on Barcelona as they fell 1-0 at Real Betis, not capitalising on Barcelona’s 2-2 draw with Valencia. Sergio Canales scored from the penalty spot in the second half after Felipe Luis handled the ball in the area. Atletico might have had a penalty themselves when Alvaro Morata was brought down in the box by Zou Feddal but nothing was given. Feddal was denied by Jan Oblak’s excellent save in the first few minutes, with Betis keeping a lot of the ball. Canales’s strike sent them ahead and Antoine Griezmann hit the post as Atletico looked for an equaliser in vain. Barcelona lead La Liga by six points, with Atletico second and third place Real Madrid in action later Sunday. Lionel Messi injury update: Will he play against Real Madrid?